Previous roles include Senior Industrial Designer at Giant Bicycle, USA in Newbury Park, California, and he has held other industrial design positions at Foremost Group and Neuhart Donges Neuhary Designers. Mr. Shiau has a Master of Arts in Industrial Design for U.C.L.A. and he has also studied industrial design at the Art Center College of Design in Pasadena, California and holds a bachelors degree from National Cheng-Kung University in Taiwan. He has been presented numerous design awards throughout his career and has had his designs published in prestigious design publications. “Daniel is an avid cyclist and a talented industrial designer. He also has a wonderful background in the industry, working with both normal bikes and electric bikes. I am very excited to have him on our management team here at Currie and to have the opportunity to work with him to move our product lines forward and into the future.” said Larry Pizzi, Currie’s President. Currie Technologies®, eFlow™ and IZIP™ are renowned for its large selection of stylish, premium quality and technologically advanced electric bicycles. 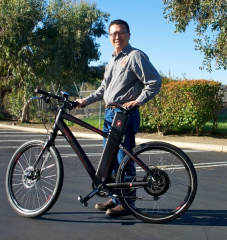 Since 1997, Currie has been one of the oldest and most established US developers and distributors of E-bikes with a network of dealers nationwide, offering a selection of models to meet every riders need for cost-effective transportation alternatives, recreation, exercise and just plain fun. eFlow™ and IZIP™ electric bicycles are perfect for anyone interested in the joyful experience of cycling without the worry of hills, headwinds and traveling longer distances. Currie Technologies® of Southern California holds various patents on its products including their Electro-Drive™ Propulsion Systems, unique electric drive systems that provide superior performance and durability at a reasonable price.